Mar. 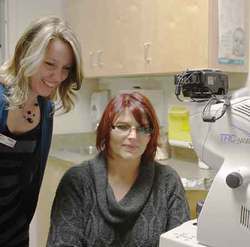 13, 2014 7:00 a.m.
Rachael McCallum & Bonnie Bolton check out the new Tele-ophthalmology equipment at the PCN Clinic in Wetaskiwin. The residents of Wetaskiwin and region who have been diagnosed with diabetes or prediabetes and have a referral from their physician or from a Primary Care nurse can access the new tele-ophthalmology testing services located in Primary Care Network (PCN) facility in the East Gate Mall at 5010c – 48 St (north of Terracotta). People with diabetes are at risk for changes to their eyes that can lead to problems with their sight and even blindness. This can happen in one of two ways. Proliferative Retinopathy – where the blood vessels become weak and blood leaks into the retina causing problems with vision or Macular Edema which is the swelling of the macula (the parts of the eye that allows one to see color). This swelling can cause blindness. Some people in Wetaskiwin may have heard the name ‘Wetaskiwin Primary Care Network (PCN)’ or may have noted the signs on the windows of the PCN facility in the East Gate Mall (north of Terracotta) but most do not realize how valuable the services are to the community. The PCN, (a non-profit health organization) was created by local physicians to extend free health care services to the community. The PCN multi-disciplinary team consists of family physicians, nurses (chronic disease, prenatal, women's & teen health focus), a dietitian, patient care facilitator, therapist, foot care specialist and now, tele-ophthalmology technicians. The PCN in Wetaskiwin is 1 of 45 located throughout the province. The Wetaskiwin ‘Network” links the services offered by the PCN main office, local physicians clinics, as well as the Wetaskiwin hospital. This keeps everyone up to date and informed on the status of the patient’s health. The formation of the Wetaskiwin PCN means physicians and other healthcare providers such as nurses & dietitians are now working within the same network towards the same goal – the health of each patient. The Wetaskiwin PCN is comprised of 25 family physicians (located in the 4 participating clinics) & 23 PCN staff, of which 18 are healthcare professionals who provide direct clinical services. Within the PCN, physicians & other health care providers communicate and consult with one another to help plan and guide future health plans and services for their patients. The services are available to the residents of the City of Wetaskiwin, County of Wetaskiwin and surrounding communities such as: Millet, Gwynne, Hobbema, Falun, Pigeon Lake and Buck Lake. PCN offers services in prenatal and postnatal care, women’s health and teen health, chronic disease management – which involves chronic illness such as diabetes, high BP, high cholesterol, weight management and quitting smoking. They also offer counselling, resource navigation and nutrition counselling. The staff at PCN will also connect people without a family doctor to doctors who are accepting new patients. Costly services and long wait times in the traditional health care system often discourage people from accessing services. PCN strives to eliminate those barriers by creating a free service where people can just walk in and get solutions and support within an hour. If clients require additional help, they are welcome to return as often as needed for brief therapy or they are directed to other community resources. Tele-Ophthalmology Clinic – www.wetaskiwinpcn.ca A team of health care professionals (Clinical Assistant & Nurses) work together to provide patients an innovative service utilizing the latest technologies for those living with diabetes as part of the chronic disease management (CDM) program. Stereoscopic digital retinal photographs of patients' eyes are encrypted and securely uploaded onto a server and sent to the Royal Alexandra Hospital for review by an Ophthalmologist. Family Physicians will directly receive the reports within only a few days. Appointments are one hour in duration & booked on Fridays at the PCN office. Speak to your family Physician or Primary Care Nurse today for a referral. Patients can take advantage of the many other services available to them through the interdisciplinary team at the PCN. For example, during their Tele-ophthalmology appointment patients will receive a basic footcare assessment by the Footcare Specialist (LPN). They will also have access to the Dietitian, Patient Care Facilitator & Therapist if they choose. The Wetaskiwin PCN is excited to offer this new service to diabetic patients in the community. The Tele-ophthalmology Clinic will help improve the quality of primary health services by meeting local needs with local solutions. “Whatever the problem, we are here to help.” For more information, call 780 312 – 2500 or visit the office at 5010c – 48 St.